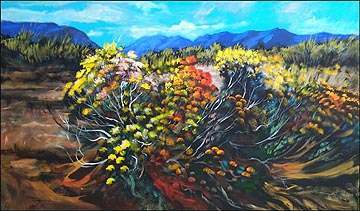 Near Virginia City, Nevada, flowering shrubs (known as chamisa or rabbit brush) make the desert come alive with beauty. Their gorgeous yellow blossoms inspired me to feature them in a desert landscape. Decide what you want to be the main "star" in your painting. Is it a particular tree? Or lake. Or the sky? Or group of trees? Creating a painting is like staging a play. When the leading man or lady is on stage speaking, you don't want one of the bit players attracting attention to himself. One way you can check to see that the center of interest is actually where you intend it to be is as follows. Turn your painting upside down while not looking at it. Walk across the room. Then turn and look at your painting. Where do your eyes go? You can't fool your eyes when you do this. They will go to the center of interest, which might not be the area you had in mind. If you're still not sure, ask someone else to look at your art while it's upside down and ask where their eyes go. They don't have to have any knowledge of art to help you locate the focal point. It's based on the natural law of vision. "If you hear a voice within you say "you cannot paint," then by all means paint, and that voice will be silenced."